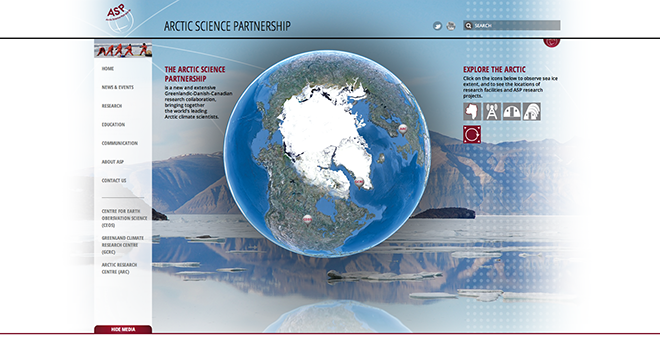 The front page of the Arctic Science Partnership (ASP) website. The Arctic Science Partnership is a new and extensive Greenlandic-Danish-Canadian research collaboration, bringing together the world’s leading Arctic climate scientists. • an interactive globe that where you can see the sea ice extent from 1979-2012. You can also interact with the globe and zoom in to see each of the 3 centres. Designed in 2012, built by Peaceworks Technology Solutions.